British naval officer Richard Aldworth commanded the survey vessel Fly in New Zealand and the Pacific from 1847 to 1851. 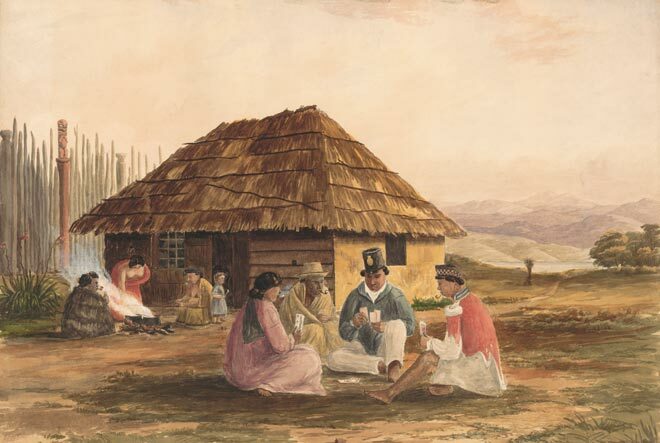 A keen amateur artist, he made many drawings and watercolours of the Māori he encountered, including this scene of four card-players outside a thatched house. From their intent manner, it appears that card games were already a popular pastime among Māori in this early period of European colonisation. Permission of the National Library of Australia must be obtained before any re-use of this image.